For the first Ten Questions of 2016 we thought it was appropriate to begin with one of our favorite debut authors of the last year, Brenda Ernst Zalegowski. 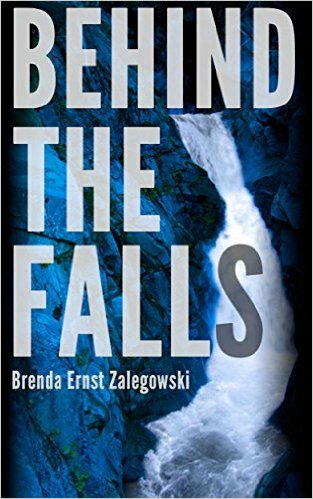 Ms. Zalegowski’s first novel, Behind the Falls, was a favorite of the Bookish Ladies as well as many of our bookworm friends. If you haven’t read it yet, check out Jennifer’s 4.5 star review and then head to Amazon asap! 600+ pages. You might ask yourself if you want to read a book that’s 600+ pages. YES YOU DO! When I noticed the page count, I thought “How is the author going to engage me for that long?” She did! I was engrossed in Noah’s story from page one. When I had to put the book down I couldn’t wait to come back to it. I mentally cheered Noah through the entire book … hoping and wishing for the best for him. I wanted to hug him and make him better. Every character is well written and believable. Why 4.5 stars? The ending. Did I like it? Honestly, no! Personally, I hate open endings. I want the author to finish the story for me. I don’t like having to guess/assume/write my own ending for a book. There were a couple of questions I really wanted the answers too and I didn’t get them. I guessed what might happen at the end but I would have liked a little closure for the rest of the characters stories. Overall, this is a fantastic debut from a new author. I’ll look forward to new works from Ms. Zalegowski. Brenda Ernst Zalegowski: Surreptitious…or kerfluffle. Kerfluffle is fun. BEZ: I’ve never met a word I didn’t like. BEZ: Two faced people and loud breathers. BEZ: Stephen King but he doesn’t drink does he? BEZ: Let’s see, I’ve tried business, the food industry, music, writing…I guess I would say decorating. I enjoy home improvement. BEZ: Oh…so final…well, there would have to be mac and cheese involved, definitely. BEZ: Maybe I could cheat and bring my Kindle? If I can bring only one actual book I think I’d choose The Stand…it’s long, it has a lot of characters and it’s one of my all time favorites. Thank you for taking the time to chat with us, Brenda!